We hate to call these artificial flowers because most folks can't even tell. 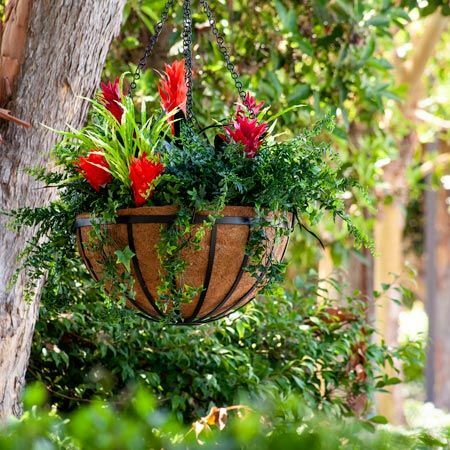 But these hanging baskets feature Azaleas that really are artificial but unlike anything you will find in a Crafts Store. Both molded and extruded from commercial grade materials - these hanging plants, leaves and vines are made with UV (ultraviolet) protecting materials and have a "Class A" Fire Rating. They offer an ideal solution for the home or office with hard to reach or inconvenient-to-water locations. These are the exact same quality arrangements that stand the test of time and endless scrutiny of hotels, amusement park visitors and casinos throughout the U.S. today. It's very likely your neighbors will wonder how you keep your green thumb whether it's 110 degrees or 10 degrees outside. These indoor or outdoor hanging flower arrangements - beyond being fade and fire resistant, come ready to hang on your porch, patio, courtyard or foyer. We've expertly combined our Black Wrought Iron Hanging Baskets with our Coconut Coir liner and a spray-foam mounting base to anchor the Azaleas in place so they're ready to go right out of the box. For Cities, Colleges, Office and Commercial Centers (or even HOA's) - the benefit of year-round beauty is likely eclipsed by the shear cost savings these arrangements offer. In today's ultra-water and ultra-budget conscious environment, it's not easy to revitalize an urban area, campus or commercial center with the inviting look and feel that flowers can bring - until now. Our menu of unique plant "recipes" feature these UV resistant Azalea's all expertly and securely arranged and mounted inside of our commercial grade Wrought Iron Baskets - ready to install. Shop hanging artificial topiary balls for a modern, all-green look. Hooks and Lattice's sister division - the Sign Bracket Store offers the complete line-up of hanging chains, sign/lightpost brackets and mounting bolt hardware custom made to your pole specifications. Turn-key, color-matched and structurally integrated all in one. Economical, "Green" and Budget-wise? - There's no watering schedule, no labor for maintenance, and no unsightly fading or color degradation that has historically made artificial plants undesirable. It's a small contribution - but every drop of water helps. As the California Legislature says - To meet this challenge, water use in landscapes must become more efficient. There are many ways to accomplish this goal and even modest improvements can have a cumulative effect in saving a great deal of water.